Imogen's Typewriter. 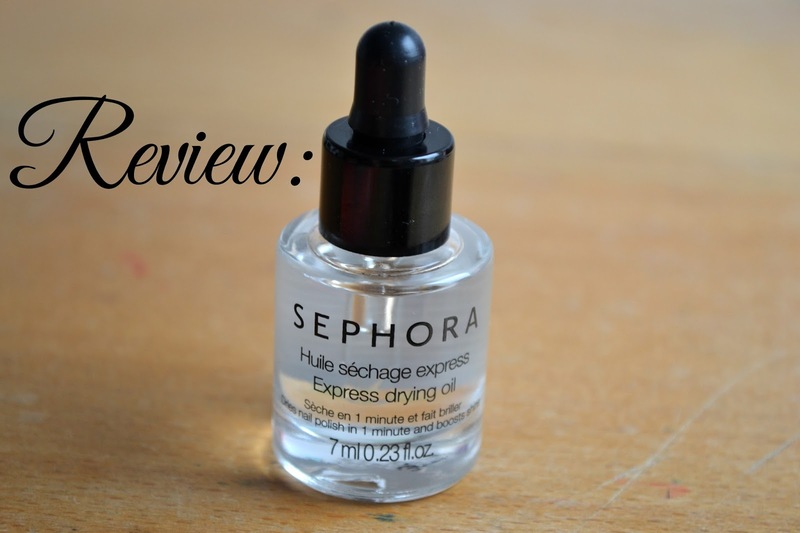 : Beauty Review: Sephora Express Drying Oil! I'm pretty patient when it comes to my nails drying but ever since I stopped using Seche Vite it seems that waiting for nail polish to dry is like waiting for the grass to grow. So when I saw this Express Drying Oil in Sephora with the promise that it would dry nail polish in 1 minute and boost shine? It was in my basket in a second! It claims that it will dry nail polish in a minute, boost shine, smooth the nails and nourish cuticles. So do I think it does this? Yes and no. Yes, the nails do seem to dry quicker and the addition of oil means that if you catch your wet nail with your finger that it slides off rather than leaving a finger print. My cuticles don't complain about it and do seem more moisturised but I keep them in pretty good shape as it is so I'm not sure nourished is the word I'd use. No, I don't think it dries nail polish in a minute or boosts shine. I think it speeds up drying! But not to a minute. And I don't notice any difference in shine. Is it worth buying? It's not as instant as something like Seche Vite but it's a handy little product to have around and I tend to reach for it when I'm using one of those nail polishes that just doesn't want to ever dry. While I was at the Essence event getting my nails done, they used Essence's drying oil so I'll be interested to see how that compares to this as it is quite a bit cheaper and more available. I can't find this online but it is definitely available in EU Sephora shops for around €9. Have you ever tried a drying oil? Do you think they work?